Google's social applications that will be included should be: Gmail, Calendar, Docs, orkut and probably others. orkut has recently launched a feature that aggregates and displays all the updates from your friends, so the new feature will be similar. 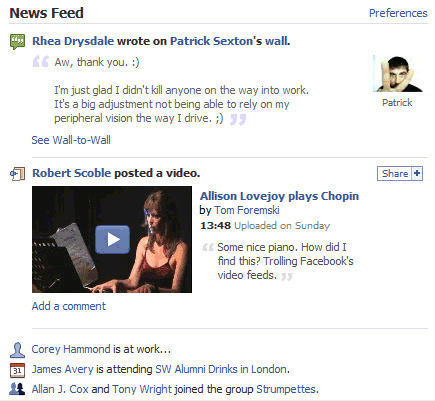 When you make these changes to your own profile, your friends will see your updates on their homepages. The new project could also mean a radically improved contact manager that shows a lot of live data from your contacts. Hopefully, the data will be searchable and only available to the persons you trust. Note: Most of the information from this post comes from a confidential tech talk in which Google's Ben Darnell explained to some Nooglers (new Google employees) how Google Reader works. This tech talk is part of the "Nooglers and the PDB" series of weekly talks, which is open to all Googlers, but it was accidentally posted on Google Video. Late late late. I am already done with my switch from Orkut to Facebook and I have lots of Indian friends on facebook. That means people are looking for other, feature rich options. Orkut has serious limitations like number of photos, no commenting on photos, no mobile support, no 3rd party apps etc. The only features that people use on Orkut is 12 photos and the scrapbook. Google should act quickly! Well it is indeed late, but better late then never. But late for you doesnt mean that its late for everybody. Orkut indeed has some serious limitations but their communities are far better than anything in facebook. Why is it that Orkut is big in Brazil? A Social Network becoming popular is often a little bit of being at the right place on the right time. Another point is that I guess there aren't that many _good_ social networks in Brazil. YES! If that is what I think of, I can only say that I waited for that a long time. iGoogle is a piece of crap, or at least the Google-provided gadgets are. They don't provide a useful summary of what's happening. Check out: "Facebook: Open Like A Granite Wall"
Needless to say Google's APIs are nicer to work with, very well doc'd and more open (in the general sense). Win the coders, win the apps and possibly win the race. I could be wrong but still, cheesing off the people that write the apps that help bring in the users is usually not a good thing. Personally I've never liked Facebook's lighting-fast willingness to sell people the electronic version of a caste system or gated community. Partly on topic the GME blog mentioned this: "Enable public read only $user feed so that applications can share $user feeds to create social applications." OK, the video has been public for almost a week, but you're right about posting copyrighted content. I removed the audio version. Yahoo! 's recently leaked info on its social networking looks promising..
yeah :P there are not so many good social networks in brazil. @anonymous: dunno why orkut is so big in brazil. but it also needs to point that msn spaces also has a huge market share in brazil. So where's the video link? The video has been removed from Google Video and I don't think it's a good idea to post it. My main problem with Orkut is that anyone can view all of my friends, and contact them. What if I only want certain people to be able to view my friend list? That is a very serious issue - one that Facebook handles very nicely. If anyone on the Google team is reading this: Please give me privacy controls or I won't use Google for "gossipy" social networking (I'll continue using Google for email, calendar&doc sharing/collaboration). Most of my Facebook friends are on my Gmail contact list - actually more of the people I actually communicate with are on my gmail contact list. And I want a unified Google communication platform (I'm waiting for the Google mobile platform). But I won't publish a social stream or keep a friend list unless there are privacy controls. I am guessing there is already a privacy framework with various levels in the works. I seriously hope so. that's a quite old news but i can't stop myself to make a comment on it. After the failure of orkut ....is google planning to launch a social networking website to compete with facebook? Google needs work hard to maintain there position in near future facebook traffic threatens google.